Striker Fabio Borini says he re-joined Sunderland from Liverpool to revive his ambitions of figuring in next summer's European Championship with Italy. The 24-year-old had a successful loan spell on Wearside in 2013-14, helping the club to the League Cup final but was peripheral on his Anfield return. 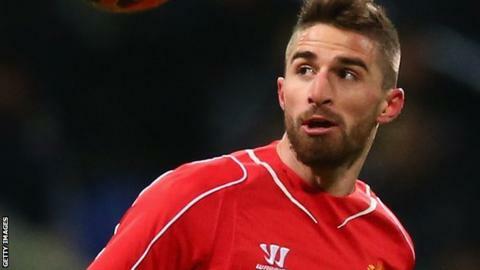 Borini, who has one senior cap, moved to Sunderland for first-team football. "My target is to achieve the Euros next year, and playing for Sunderland regularly I think I can," Borini said. He told BBC Newcastle: "We need players in Italy to play every week." Despite his success at the Stadium of Light, and a familiar manager in Brendan Rodgers with whom the Italian had worked at Swansea, the versatile forward failed to break into the Liverpool squad. Not even the departure of Luis Suarez or injury to Daniel Sturridge saw him make progress, leading to his exit - having previously turned down a return to Sunderland in the summer of 2014. "It's been frustrating, I can tell you that, and I was bringing [that frustration] it home and it wasn't nice to be upset," he added. "I wasn't even on the bench when there were not strikers available. "They [Liverpool] made me train at a different time than the first team so I was not seeing the other players - not because of my behaviour, something I did or said, I did everything right, I can't really say because I don't know."